I suspect you’re like me and wanting to find a helpful role since the #WomensMarch, to speak up for what you feel is right in the world and in your community. But what do you do? What if you don’t like demonstrations or traditional activist roles, but still feel called to engage more in some way? So many feelings. It’s a lot to take in all at once. Is your head spinning? Heart aching? As we saw during the Women’s March, when women speak up, we become a force for something greater than ourselves. But it doesn’t only have to happen on the streets, in large groups, with loud voices. It can happen in quiet ways too, just as powerfully and stemming from the same place of love and spirit. I’ve chosen some priorities for myself. First, I’m upping my self-care and sisterhood connections so I can stay clear and calm. Second, I’m expanding on my political and social justice activism in ways that feel right for my strengths and my temperament. Third, I want to help other women find their calmness, community, and clarity. 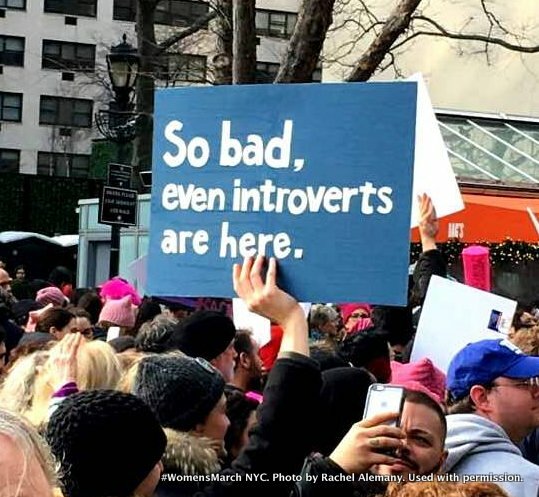 Specifically, I’ve decided part of my role is to help other introverted women find their grounding and their unique roles to play, in a way that aligns with who you are. and have the impact you crave. Let’s explore this together in a small group space where I’ll facilitate a grounding and clarifying process. We’ll explore introvert-friendly ideas to engage in creating change. I’m offering this gathering as a free gift, with no strings attached. It’s part of what I want to add to the movement for women speaking up. Come to a free gathering for finding solid ground, community, and clarity. I’ll host at least a gathering (or two) in Northampton MA, and one that is virtual. I will make it a low-key safe place to explore what we can do now. Nothing is forced. No judgment of any kind. There will be room to think and breathe and connect. You can just come to take a breath together. And you can choose to explore what might be your unique role to play, in a way that aligns with your nature and your interests. Maybe you’ll even meet some kindred spirits who will take the next steps alongside you. You’ll find that what we’ll do is useful for more than just the political climate. We’re talking about clarity, confidence, and bringing your gifts to the world in small and large ways. Feel free to come for those self-discovery reasons too. Please let me know of your interest and meeting preferences using the form below.